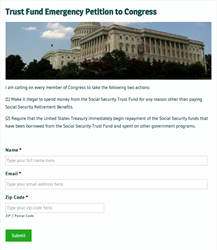 The Trust Fund Emergency Petition to Congress is available to sign at The Seniors Center website. America’s senior citizens are furious. They’re financially responsible. They saved for retirement. Don’t they have the right to expect the government to do the same? Today seniors advocacy nonprofit The Seniors Center announced their Trust Fund Emergency Petition has officially hit another crucial milestone on its way toward meeting a one million-signature goal. The national petition drive has collected signatures from over 360,000 supporters, seniors, and Americans concerned for the financial stability and future of Social Security. The Trust Fund Emergency Petition is the cornerstone campaign of what Perrin and The Seniors Center hope to build into a massive grassroots effort to dramatically change the way the federal government handles Social Security investment and financing. And legally requiring the United States Treasury to begin to accelerate the process of repaying all funds taken from Social Security. In the coming weeks, The Seniors Center plans to unveil new legislative initiatives to add to an already growing grassroots movement. For now, the organization will continue to focus on reaching their one million-signature goal, collecting signatures through their online petition and via traditional mail to supporters. To sign The Seniors Center’s Trust Fund Emergency Petition, please visit The Seniors Center’s website. To get more information and get involved with The Seniors Center, visit http://www.TheSeniors.Center.